Venturing out into the early morning, Cobalt ran across a new pony while seeking the place called Sugarcube Corner. Her name is Pinkie Pie, and she has a thing for parties, new ponies, and getting really excited for whatever reason floats her puffy mane. School was school. Excitement happened during lunch, when Cobalt received a kiss on the head from Miss Cheerilee for being such a sweetheart and giving her an apple. Additionally, Cobalt spoke with Silver Spoon, alone, though she warned him to stay away for fear of complications with Diamond Tiara. Cobalt then met with the CMC after school, traveling to their clubhouse and discussing the matter of Silver Spoon. Left with merely more questions on how to proceed, Cobalt decided to head back for the night. He forgot to meet Pinkie after school for that shake. Hopefully she won't mind. 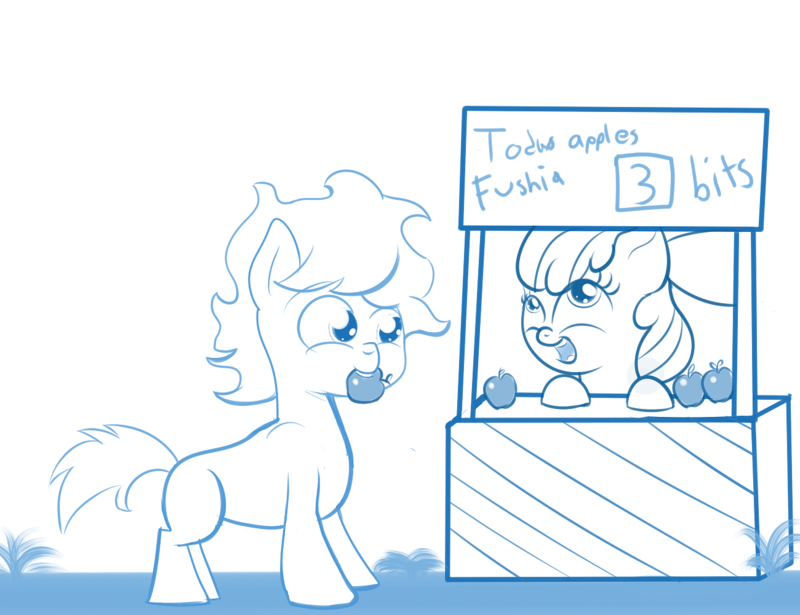 Additionally, he still has one perfect apple that Apple Bloom gave to him for dirt cheap. You wake up with a dreadful yawn, stretching your limbs out and rubbing your eyes before hopping out of bed and wandering downstairs to eat breakfast. Would we have fallen down the steps on a 1? Breakfast is a hearty meal of cooked oats, with some juice to wash it down. With breakfast out of the way, you grab your things and set out for the day. >Where do you wish to go? We going to be silk again tonight. We should apologize for flaking out on Pinkie yesterday. You gotta stop listening to the same music as me. 2spooky. Sugarcube Corner, we got to explain ourselves to Pinkie for not showing up yesterday afternoon. You feel a slight regret at flaking on Pinkie, even if it was to talk with your new friends. So you decide to head to Sugarcube Corner, heading out into the long shadows and slight chill of the early morning. The way there is less eventful, now that you know the way. Early morning ponies are doing their business around town, some opening shops and some just conversing with one another with smiles on their faces despite the hour. Then again, if you're up right now they certainly can be. You reach Sugarcube Corner proper, walking up to the big gingerbread looking house and raising a hoof to knock when you hesitate. Is the place open or not? 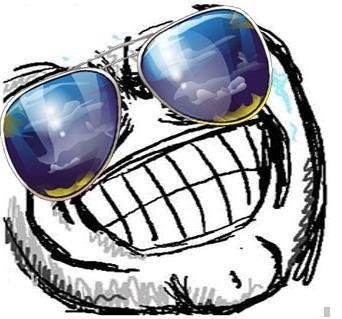 >Maybe I should do this AFTER school…. it can't be THAT early, can it? Head on in Sugarcube Corner is a business after all. You check the clock in the plaza. It's about 6. Class doesn't start for a bit yet and it's not incredibly early. They should be open. You raise a hoof, knocking firmly against the door. Some time passes, but you think you hear some shuffling about through the door. Maybe whoever is inside is busy and didn't hear you? But if there's someone inside, then they're open, right? Bust thru the door starting into a song and dance. You're a little conflicted on what to do, exactly, so you crack the door open, looking inside before calling out: "Hello?" There's a small yelp of surprise and the sound of something hitting something else pretty hard. While somepony in the store groans for a moment you head inside, noting the dimly lit interior. The lights in the front of the store aren't on, but the ones in the back seem to be turned to about half power. Maybe they're still getting ready for business? You keep walking inside, avoiding the shadowy outlines of tables and chairs until you reach the only brightly lit spot in the storefront: the counter. Light reflects off the cash register and a notepad with some scribblings on it, which rests beside a service bell. No pony has yet to show themselves. DON'T head down into the basement. Read the note ring the bell. Cobalt: Eyes of red, rest two shades of blue; It was quite the pleasure to meet with you! Sorry for bothering you while working, and taking your owl while you weren't looking; I put him back to make things alright; Don't stay mad at me, my friend Twilight. Silly Silver, don't look so sad. Meeting new ponies should make you glad! Things will work out, just you wait and see; And even if not, you can always party with me! It looks like a list. It continues to the next page, as indicated by a tiny arrow in the bottom right corner. Flip it over and read the rest! Then ring dat bell. A note for us, one for Twilight, and…is that referring to Silver Spoon? 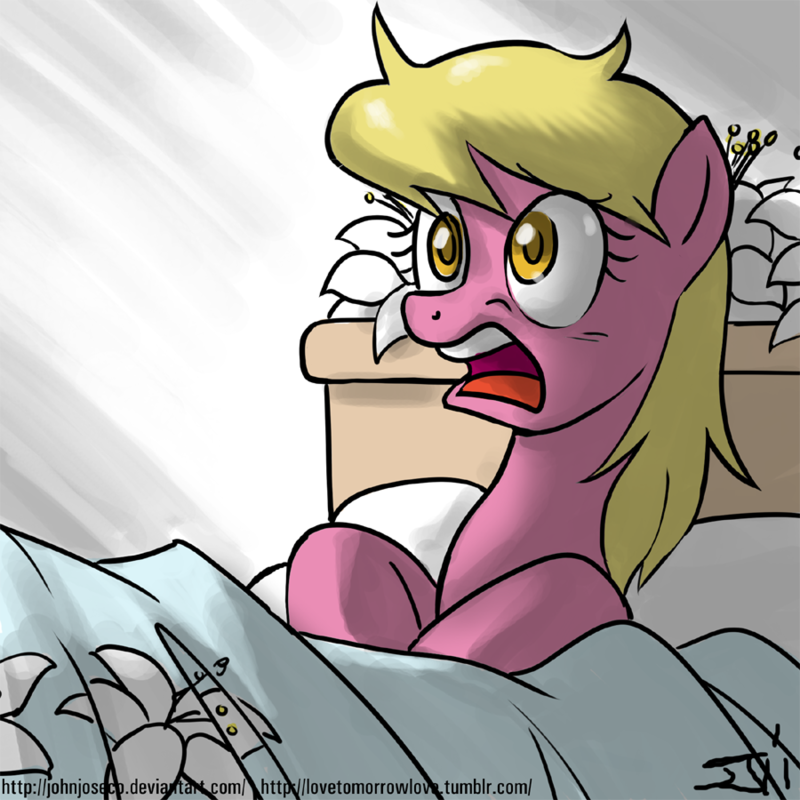 I-is Pinkie or whomever spying on us? I think we've read enough. Put the note back and ring the bell. Anyways, yeah keep on reading. Don't let me sway you, but that list seems pretty personal/private. I wouldn't want whoever dropped it to find me reading something like that. I think Silver Spoon came to them to tell them about it. You're torn on whether to keep reading or not. It seems personal, but it's just lying here. Curiosity getting the better of you, you flip the page of the notepad and keep reading. Thanks for the donation of mint sticks, Twist! Without your help I'd have been in a fix! You nearly jump out of your skin as a voice calls out from the darkness around you. Suddenly Pinkie is in front of you, snatching away the notepad. "Cobalt! What're you doing reading my sing-song notepad?" See? SEE? I knew we should have just let it sit. Now we're busted. "I-I saw my name and…I guess I got too curious…sorry…"
Man we're getting on Pinkie's shitlist fast, if she even has one. You lower your head in shame, "I-I'm sorry, Pinkie. I saw my name and just got curious…." You look back up at her, "Sorry." Pinkie's expression softens into a small smile as she puts the notepad somewhere under the counter. "Well, you shouldn't go through other ponies stuff like that. Though I guess I'm a little to blame since I left it out on the counter, huh." She suddenly sticks her tongue out a little bit, "But I'm still mad at you for not coming to see me yesterday! You read my notepad, so you saw the song idea I had. It was just for you and I was gonna give you this awesome blue milkshake that tastes like strawberry chocolate, and-"
She shakes her head, "Whoops, there I go again. Just….ring the bell next time instead of snooping, okay?" "Anyway, now that you're here and that's cleared up: What's up little pony pal?" Apologize for not showing up yesterday, explain we got caught up making new friends. You tell Pinkie you didn't drop by yesterday because you were busy making friends with the CMC. Her eyes light up and she reaches a hoof out across the counter to give you a noogie, rubbing your mane into your head fiercely till you think you're gonna go bald. "Then you are totally forgiven my little blue friend! Making pals is the best! Hey, wanna celebrate with that shake I mentioned?" "Isn't it kinda early for a milkshake?" Pinkie lets loose a raspberry and waves a hoof dismissively, "Puhleeease! Any time is shake time, especially celebratory shake time!" You try and change the topic for a moment, and ask Pinkie how to best make friends with a bully. Pinkie ponders, hoof to her chin as she thinks, before pressing the service counter bell; "Idea! It's like my mom used to say: Kill 'em with kindness! Everyone has a bad day, and once in a while there's a bad seed in the bunch, but if you treat 'em with kindness enough times then they'll either like ya or learn to leave you be!" "Anyway, back to important matters: You want that shake? Or can I convince you to take a doughnut at least? Maybe a dozen?" We have time for the shake too, right? Why not lets have the shake and grab a box of donuts. The approximate time is 6:20. You've got quite a bit of time. Eating both might cause some sugar rush shenanigans and a crash later. Is a dozen doughnuts enough for the whole class? If so, doughnuts, if not shake time. Also, we still have that apple, Right? We should make sure it gets on the desk this time. We gave it to her for lunch, this would be a breakfast apple. I wonder if the apple would just sit in our bag and rot if we don't use it. Could this lead into a Pinkie route? "C-can I have both?" you ask nervously. Pinkie stares at you for a moment, completely still. Suddenly you're halfway across the counter being crushed in a giant hug, face against Pinkie's chest as she laughs. "You and I are going to be the best of friends, I can already tell!" Finally the doughy smelling pony lets you go, dashing to the back to get stuff for you. You hear a blender whine and an oven open and shut, then she's back out at the counter, a box of doughnuts gently set on the counter and a rather large looking shake placed next to it. She puts a straw in the shake's lid for you before smacking a button on the cash register. "Alright little guy, these ones are on me this time. This is just the 'Hey you're new in town have some awesome free sweets' deal that I only do once, just ONCE, for each pony. Got it?" You nod eagerly, wondering how you're gonna get all this stuff to class. "Alright Cobalt, I've gotta get back to work, okay? Morning rush is gonna be here soon. You can take a table while you drink your shake and eat some doughnuts if you want," she winks, "Just don't go anywhere you aren't supposed to or snoop around again, okay?" Your cheeks burn a little but she just laughs, "No harm the first time. I understand being curious, but now that you've been warned there'll be trouble if you do it again." And with that, she heads back into the kitchen to continue preparation for the day. #Pinkie status: Great friends! Or at least she thinks you are. We'll share 'em with the class! Still have a lot of time before classes start yeah? Drink shake! Save doughnuts for classmates. Sit down have the shake, save the donuts. Pony watch as you enjoy. Pony watch with the shake sounds good, but not for too long. You move your doughnuts and shake to a table near the corner of the room after Pinkie turns all the lights on. Weird that you didn't see her have to come out to do that, you thought the light switches were out here. Whatever. You take off your saddle bag, setting it on the table next to your doughnut box as you start to sip on your shake. It tastes like chocolate with a hint of strawberry and….blueberry? Either way it's rather sweet, and tastes pretty good. You check a clock on the wall, now that it's visible. The time is nearing 7, so you have to go to class by 8. Your thoughts are interrupted as the door opens, and ponies of varying kinds start to enter. Some of them are bright and excited, others look like they need a cup of coffee or something to kickstart them. 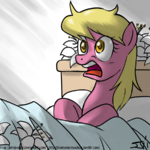 You're admiring the blonde mane of a pink pony when the door opens and you hear a familiar voice. "Yeah, yeah, I'll see you in class, okay? Alright, later!" The door swings shut behind her as she walks into the store proper. She hasn't seen you yet in the corner, though it's only a matter of time before she does. Why not… Say hi and wave. Cherry Berry is a pretty pony. You stop drinking your shake long enough to yell hello at Scoots, waving your hoof when she looks in your direction. She smiles and waves back, though she doesn't leave the short line she's in. Eventually she comes over to your table, carrying a paper bag with her order in it in her teeth. She sets the bag down on the table in the small open area that's left on it before sitting down in the chair opposite you. "Hey Cobalt. What're you doing here this morning?" She looks at you over your saddlebag, "Wait a sec; is that a shake? This early?" Explain the whole "Pinkie thing". Leave out the song book part. I wonder what she'd do if we offered some of our delicious shake. You briefly explain the situation with Pinkie, how you felt you had to apologize and all that. Scootaloo listens to about half the story before fishing something out of her paper bag. It looks like a muffin, with some kind of stuff in it. Berries, perhaps? She takes a big bite as you finish your story, then mumbles, "Oh," through a mouthful of food before taking another bite. She swallows before adding, "Yeah, Pinkie can get kinda weird if you don't keep her up to date on things. Like one time I didn't tell her that I was going to see Dash perform some air stunts on my birthday, and so I was gonna be out of town day, and the next day she was at my door looking all sad with this apology cake because she thought she'd gotten the day wrong or made me mad or something. It was really awkward trying to explain it to her. I thought she'd be mad, but instead she just cheered right back up and threw me a little mini party on the spot anyway," the fond memory brings out a smile on Scootaloo's face before she coughs gently, "Man, these muffins are dry today and I forgot to get a drink. I'll be right back." Offer some of your shake. "Give it a try. It's chocolate-strawberry…blueberry…or something." You hold out your shake in a gesture of good will, causing Scootaloo to raise an eyebrow. "You can have some of mine, if you want," you say, only faintly feeling your cheeks tingle as you realize what you're doing, "It's chocolate-strawberry-blueberry something or another. It's really good." "That sounds pretty awesome," Scootaloo says with a smile, walking over to you and taking the milkshake from you, "Thanks, Cobalt!" She takes a big, long sip from your shake, and you hear her hum in approval of its taste. She takes a shorter, second sip before handing it back with a smile, "You're right. That IS really good." She looks at the clock before putting her half eaten muffin back in her paper bag, "Hey, it's getting close to school time. Wanna head over there together?" You look at the clock. It's about 7:25. It's definitely time to be heading out. "Yeah, one sec," you say, hopping out of your chair and draining the last of your shake before putting your saddlebag on. You move to put the box of doughnuts on your back and Scootaloo raises one of her eyebrows again. "Are you sure you can carry that without dropping it?" "Well, if you put those in two bags or something we could carry them that way. Or I could put the box on my scooter and we could use it like a sled or something." I think this would be the safer way, right? I guess I'll change my sled vote to bags. we can take our time and walk/talk that way. our doughy cargo is more fragile right now than our relationship with Scootaloo. Priorities. You decide to put the box of doughnuts on the scooter, then move the scooter itself to ensure safe transport. It's the same speed as a walk with the benefit of not dropping a box from your back and ruining all of them. You thank Scootaloo for letting her use her scooter in such a manner. She just waves a hoof, "Ah whatever. That's what friends are for, right?" You smile and the two of you head toward school, sweet cargo in tow. You make it all the way to school with not a single problem. You thank Scootaloo again for the help as she wheels the box into the main hall of the school, the two of you there about 5 minutes before class is supposed to start. "Hey, like I said, that's what friends do. Besides, it wasn't difficult or anything." You pick the box up and Scootaloo folds her scooter in half to put away in one of the lockers in the hall, "Need any help carrying them into class?" 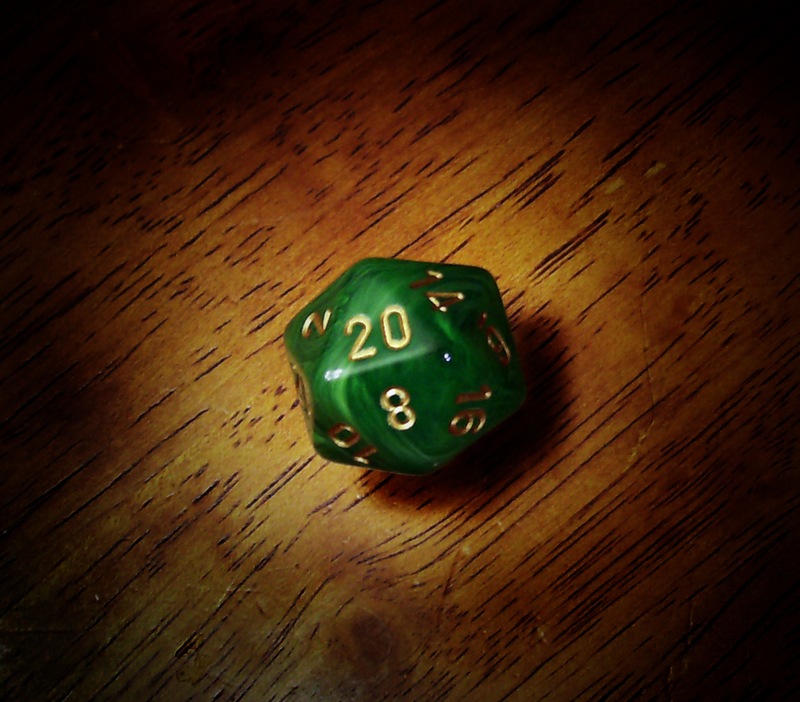 We didn't roll a natural 10 just to fumble and drop the box on the home stretch. We are going to share them, right. "Sure, why not," you say with a smile. The box lays across your back and Scootaloo's, angling slightly since she's a bit smaller than you. She flexes her tiny wings upright to make the box level before you both walk into class. A gasp ripples through the classmates inside when they see the box, and eager conversations start while you and Scootaloo take the box into the room. Miss Cheerilee looks confused as well. 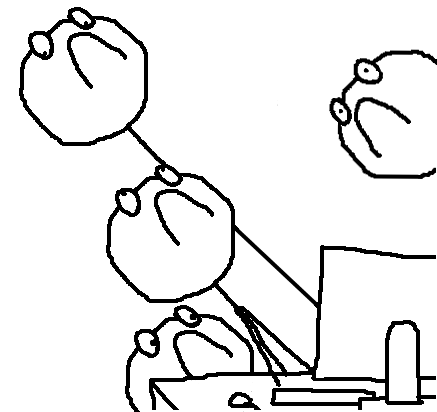 "Cobalt, Scootaloo, are those….are those donuts?" Her expression lights up, "Did you bring a treat for the class?" Yeah. Courtesy of Sugarcube Corner. Yes, courtesy of Sugercube Corner, and I don't know how I would have got them here if it wasn't for Scootaloo. ALSO THIS, but make sure it's done in a way that WE give Diamond Tiara her doughnut. You smile at Miss Cheerilee, summoning your best public speaking skills. That is to say, you only stammer a little bit. "Y-yes! From Sh-Sugarcube Corner," you look at Scootaloo with a sincere smile, "And I don't know how I would've gotten them here without Scootaloo's help." "Well that's very kind of you and of Sugarcube Corner, Cobalt and Scootaloo," Miss Cheerilee turns to the class, "Well, class, you heard the young stallion; Looks like we have doughnuts for class today!" The class erupts in cheers as you and Scootaloo set the doughnuts on Miss Cheerilee's desk while she pulls some napkins out from a drawer behind the desk. "If you two would do the honors of passing them out, without playing favorites, that would be most appreciated!" You offer one to Miss Cheerilee first, since she's right there, but she gently refuses it until the students have all been taken care of first. Gotta build them friend points, and I don't think Scootaloo wants to be the one to give it to them. Are there enough donuts for everyone? 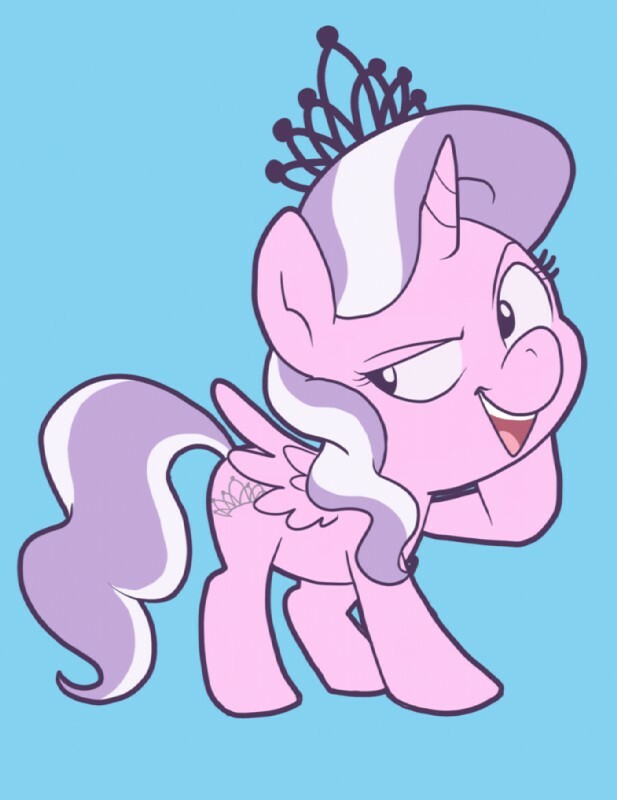 Oh god, we're going to drop Diamond Tiara's, aren't we? Scootaloo's face is red as a beet for some reason, in the one good look you get at her when she isn't looking. >Are there enough donuts for everyone? You quickly take a head count in the room, including yourself and Scootaloo, then count the doughnuts in the box. The box contains 13, a tiny note in the corner saying "Baker's dozen!" with a poofy maned smiley face. The class has 14 members in it. You'll be one short. We already ate one right? I say we give everyone in the clase 1 doughnut. We can go without a donut, since we had that shake earlier. It's our duty to suffer for kindness, give away ours. You decide to hand out doughnuts to Silver Spoon, Diamond Tiara, and three other ponies that sit near them, while letting Scootaloo hand out doughnuts to your friends and some of the others. Miss Cheerilee will hand out the remaining. You decide you'll go without since you just had that shake. Barring a pony turning down a doughnut for some reason you'll just abstain. Or you can eat that apple, perhaps. Either way. Also, Sweetie isn't in that class, and only a recolored, cutie marked Scoots. I digress, I need to get back to typing. YES, You'll eat that apple, and point out to MISS CHEERILEE that it's not that different, it's sweet,delicious, AND healthy. 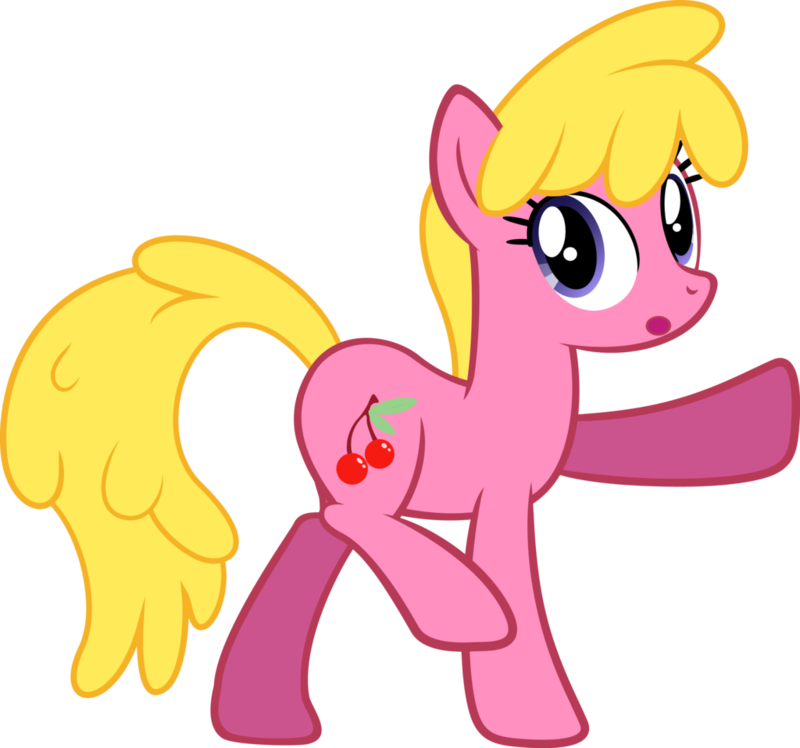 And by MISS CHEERILEE, I mean "Miss Cheerilee and the rest of the class, including Apple Bloom"
Make sure Brynn gets a doughnut. He'a a bro. But why are we crying? You hand a doughnut to Silver Spoon, who smiles eagerly, rubbing her hooves together as she says "Thank you, Cobalt!" It gives you a warm feeling in your chest as she takes it from you, still beaming at the sugary treat. Next up is Diamond Tiara, a pony who you've never really met but heard much about. You retrieve another doughnut, handing it to the pink, tiara wearing pony. She lets out a gentle "Harumph," noise before taking it, then sighing and giving way to a small smile, "Well, at least it's cream filled. Thanks, blue boy." You hand one to a familiar, curly red maned pony wearing thick, purple glasses. "Hey, you're that pony who was on the swingth with me yesterday!" she says happily, "Thankth, uh, Cobalt, wath it?" She seems to have a bit of a lisp, but she's friendly at least. She introduces herself as Twist. You recall the note in Pinkie's notepad, and notice the candy cane cutie mark she has. So…she must make candy? Maybe you'll have to ask about it later. You hand a doughnut to two of your other classmates, when Scootaloo notifies you of a problem. "Hey, that pink one with the braces who sits next to you, she doesn't want one because she's afraid it'll get stuck in her braces or something." You look at the pink pony who sits next to you, not knowing her name, and she just smiles sadly as she gently shakes her head. You have one doughnut left, and all ponies other than you, Miss Cheerilee, and the pink braced pony have one and are happily munching away at their unexpected treat. Just tell her we already ate before we came over here. Give the last one to Cheerilee. We don't need the sugar rush/crash. >Maybe you'll have to ask about it later. Give it to Cheerilee, we already had a nice treat this morning. You give the last doughnut to Miss Cheerilee, who asks if you're sure you don't want it before taking it from you. "First you bring me an apple out of the goodness of your heart, then you treat the whole class? I don't have words for that kind of generosity, Cobalt." She leans down to whisper, "Here's a hard candy for the one with the braces, you can give it to her so she doesn't feel left out." She places a small wrapped candy in your hoof, "Don't feel like you need to do something like this every day though, okay? Don't want you to burn out after your first week here after all." Miss Cheerilee giggles, then pats you on the head, "Now take your seat, once everyone is finished we'll get started for the day." Give it to nameless pink pony, she will surely help us during the final boss. You head to your seat, before leaning over and putting the hard candy on the braced pink pony's desk. She lets out a little gasp, then reaches over and hugs you, tiny hooves wrapped around your neck as she whispers, "Thank you!" in your ear. She lets you go and unwraps her treat, popping it in her mouth before offhandedly mentioning, "Right, my name is Dawn. Sorry for hugging you, I just….couldn't help myself." Before you can ask her anything else, Miss Cheerilee calls the class to attention and begins her daily lesson. Give it to pink pon. Despite the sugar wearing off from that shake you drank this morning, you stay awake in class and don't miss anything important. Recess sounds and most the ponies are out the door once again, this time Brynn getting outside right quick as well. Weird. Dawn, Scootaloo, Silver Spoon, and Miss Cheerilee remain in the classroom for now. I want to say talk to Silver Spoon. But I don't know what we'd talk about. You look around the relatively small classroom. DT is nowhere to be seen. You decide to approach Silver Spoon, saying hello when you get close. You startle her a bit, as she was writing a note or something, which she hides in her desk immediately, before responding with a meek, "H-hey, Cobalt." An awkward silence drifts between the two of you before she pushes her braid back, despite it already being behind her ear, and says, "So, uh, thanks again for the doughnut this morning. It was good, and really nice of you. Especially since, I, uh, wasn't exactly the nicest to you yesterday. Sorry." Also, maybe we could ask her what she thinks of Sugarcube Corner? That note from this morning seems to imply that she visits there sometimes. Is that 3 SS points now? "It's no problem, I understand. I'm glad you enjoyed it. Sugarcube Corner makes some great sweets, don't you think?" seconding this. Or, ask her why she hangs around DT so much. She can't be all bad. "Don't worry about it," you tell her, easing her a little bit, "So, uh, what do you think of Sugarcube Corner? They made the doughnuts and I hung out there a little this morning. Seems like a nice place." Silver nods, making her braid bounce a little, "Yeah, it's pretty much THE place to go for sweets and baked goods in town. Nice place to hang out once in a while, unless you don't like Pinkie, but that's a different story." >I think so too. And Pinkie is pretty nice. >I don't know if it's my kind of place. Maybe she'd like to go with us some time? First 5 rolls of 1d10 taken. 15 or lower makes you break down, spilling that terrible pasta everywhere. Middle ground means you keep your composure, but you aren't very convincing. No ups or downs to it, it's just flat. 40+ is a convincing tone/body posture/something that makes it more suitable/appealing. Should you get a perfect 50….well. Do it first then we'll see. Text required because otherwise it says Flood detected. So does that mean we lose 10? CAN WE FILL THE CLASSROOM WITH PASTA? "So, uh, maybe you'd like to hang out there together some time?" you ask, more than a little nervous as you ask. Silver Spoon adjusts her glasses, "Are you asking me out on a date, Cobalt?" She's turned the conversation on you, better keep your cool. Same rules as before, but this time if you score less than a 30 you'll fall back on stammers and not really being able to keep the conversation going. Might not necessarily be a bad thing, but it sure won't look good. The dice gods have turned their backs to us. Sure seems to work that way. Your heart races and your cheeks flush; Aw crap. You try to say something but you can't do more than mouth sounds. Eventually you give up and just sigh, putting your face in your hoof while Silver Spoon laughs near hysterically, nearly falling from her chair. Eventually she stops, removing her glasses to wipe tears from her eyes, "Oh…oh my, I just…I just…..your face….," she resumes laughing a hearty chuckle before finally calming down. "You're a funny guy, Cobalt." "So….is that a yes?" you ask bashfully. Silver Spoon gets up from her seat, moving beside you before shaking her head gently, still smiling. "Thank you, but I don't think that's possible right now. Maybe another time." With that, she heads outside. You look around the room to see who all saw that, and are relieved to spot only Miss Cheerilee. The others must have left while you were still talking to Silver. At least she didn't just flat out call us a loser and never associate with us again. Resign ourselves to the thought of never talking to Mrs. Cheerilee again and go outside. This never happened. Well, at least we got that SS point. Let's go drown our sorrows in playing with our friends. You head outside, head down in disappointment until you feel sunlight on your mane. You look up, scanning the playground for the CMC, Brynn, Twist….anyone really. Sweetie and Apple Bloom are playing with hoops, playing around with….Brynn? Several other ponies also participate as well. Dawn and Twist occupy the swings, which are currently full as there are only two seats. You can't seem to find Scootaloo. Where could she be? Go to the group and see what's gotten into Brynn. We'll probably spill the rest of our pockets on Scootaloo, so hang out with Sweetie and the gang. Talk to e CMC, ask where Scoots is. You head to the large group, winding your way through waiting ponies to Brynn. "Brynn? What're you doing? I thought you'd be reading your book or something." He jumps a bit, startled, dropping his hoop, before turning around to face you. He levitates his hoop while saying, "H-hey there Cobalt. I, uh, just, really like playing with the hoops when they're out. It's something I'm kinda okay at that isn't reading, you know?" He takes a moment to lean forward, "Also that book I was reading got real creepy and freaked me out. I don't really want to read any more of it right now…"
With that, he lets the ring go and starts spinning it around his torso again, keeping it near the middle of his body. Good thing it's a smaller hoop or it would've hit the ground on the first spin. Sweetie and Apple Bloom call out your name simultaneously, all smiles as you look at them spinning their own hoops. That is until Sweetie gets a little too excited and forgets she has a hoop around her, and starts walking forward. Poor gal trips over her own hoop and careens into Apple Bloom. With a yelp and a loud thud the two hit the ground, hoops and all. Luckily they and the hoops are only scuffed up and the only thing really damaged might be their pride as the crowd shares a laugh. You can't help but chuckle as well. Look at them and laugh. You help Sweetie up while she rubs her head with a hoof, mumbling something before thanking you and standing on her own hooves. Apple Bloom gets up herself, popping her back in the process before telling Sweetie to watch what she's doing next time. Sweetie Belle offers you her hoop, "I think I'll take a break after that. Here, do you want to try?" >Are you sure you're okay? You take the hoop from Sweetie, feeling the need to burn off some nervous energy. And that milkshake. Sweetie moves back into line with the crowd while Apple Bloom puts the hoop back around herself with a grin, "Need any tips there, Cobalt?" Are you asking for a CHALLEEEEEEEENGE?! "No thanks, I got it. I think." "By the way, are you alright? That fall looked painful." Apple Bloom grins, "Wasn't nothin' I haven't had happen before, don't worry. I'm tougher than I look." You eye her skeptically until she starts spinning her hoop properly, looking like she's alright in the process. Trusting her own judgment you start spinning your own hoop around your body. It's kinda slow at first, and you're a little bigger than some of the others so the hoop feels a bit small, but you manage. It's not really all that challenging. Recess ends with you still spinning the hoop, but feeling a little better. Apple Bloom collects the hoops and takes them inside to a storage cabinet with you close behind. The two of you head inside for lunch, and you're happy to spot Scootaloo in the classroom with all the other ponies. Lunch and the afternoon set of classes pass uneventfully. Class ends and ponies begin to shuffle their way out the schoolhouse. You don't recall having any plans this afternoon, a mild stab of something like regret pinging at you when you think of Silver Spoon. Ask where Scootaloo was, we didn't see her at recess. >It's something I'm kinda okay at that isn't reading, you know? You decide to see if Brynn is around. Checking outside, you see him in his usual reading spot at recess, though he has his saddlebag with him this time. He's reading a book that doesn't look quite like the one he had a couple days ago. It's much thicker and heavier looking than the other one. He does seem to be reading though. Perhaps it would be best not to interrupt. Then again you haven't talked to him in a couple days other than at recess today. What's he looking at now? Did he finish that spooky book? Would he lend it to us? Brynn notices you as you approach, for once, and closes his book when you draw near. "Hey there Cobalt. How are you?" it's starting to get pretty serious"
You tell Brynn about your encounter with Silver Spoon, and halfway into your story he puts the book back in his bag, focusing entirely on what you're telling him. You tell him about how she shot you down, basically, and he visibly cringes as you finish your tale. He sighs, "Jeeze, Cobalt. I, I don't know what to say. Other than I'm sorry, I mean," he smiles sympathetically, "But hey, at least you can talk to the girls. I can hardly talk to any pony, but especially them. Except for Dawn, she sometimes talks to me. She's pretty nice." He shakes his head, "I digress. I wish I could give some advice with Silver Spoon, but I don't think I'm anywhere near experienced enough for that. At least she said she'd think about it, or something, right?" Also we'll be ending soon, just trying to wrap the day up before doing so. Everyone seems to be dropping or getting tired/I'm boring everyone so I think it's nearing a good stopping point. About as likely as us getting with Cheerilee. are you saying we should double date Twilight and Cheerilee with Brynn? "So, what're you reading?" you ask, pointing to Brynn's saddlebag, "Looked a lot different from the book you were reading a couple days ago." "Oh, that?" Brynn says, pulling out the heavy looking book, "It's a book I got Twilight to lend me. It's a pony legends/mythical creatures thing she found in the library. And before you ask, no, it's not for games or anything. It's serious." You ask for an example and he flips the book open, reading from one of the pages. "Legend 255: The mare who once controlled the everfree. Old lore speaks of a mare who once lived within the Everfree, free from harm of the dangerous forest's denizens. Supposedly, she could control where anything grew or lived, making trees move with but a whisper and sending the animals scattering with a wave of her hoof. One particular adventurer, named Hardsooth, described her after supposedly running into her…." Brynn smiles, "I know, right? It's just filled with stories and diagrams and supposed ways to bring some of these ponies/spirits back or talk with them…." He blushes before shutting the book and putting it away, "Well, I don't know how true any of it is, but it's pretty interesting to me. Mark my words; One of these days I'm gonna try something from it," he swallows hard, "I-if I can work up the courage, anyway." Make sure you bring me along! Gotta have a tough-guy meatshield, right? "Hah, yeah, well, some of those can only be done at certain times. And according to the calendar in the back it's nowhere near time for the ones I'm really interested in. But I'll make sure to try and tell you about it before I try any of it, okay Cobalt?" You nod, and the two of you shake hooves that he'll have your assistance should he try any of that crazy stuff. Brynn has made a promise: In the event he attempts any weird ritual/magic/whatever stuff, he'll tell you about it first. Don't expect it to happen any time soon though, he's just as nervous about it as you are, if not more so. The two of you decide to part ways after that, Brynn saying he needs to head home and finish his homework. You're feeling a little beat yourself. The sun is only just starting to set, but you decide after today's events maybe you should take the easy route and just get your rest. Fun fair is only two days away anyhow. More than one night's sleep would be pretty good. With that in mind, you head home for the night. Calling it since everyone seems pooped and I'm starting to peter out myself. I'll give you guys a roll bonus next session for the dull ending. We can also skip that day and go straight to Fun Fair day if you'd like, unless you want to try and squeak out some emergency relationship points for that day. Anyway, thanks for joining, sorry I wimped out. Have a nice night guys. Thanks for questin' again Aspy. No problem. I just feel bad leaving you guys with such talk heavy stuff. I guess that's the start of things for ya though. And relationship building. Anyway, thanks again for joining everyone. And as always I'm always down for some critique/suggestions. The quest is there for your guys enjoyment after all. Another fun session, but now time for bed! Yes, thank you/the staff of the sub for doing that. I'm enjoying it so far. Even if you say this session was a little dull, it still gets me needlessly over excited which I always have fun doing. Heh, it caught me off guard. Just doing my job. Anyone have an already made pic of what Cobalt looks like? Hair, mane, tail and colors. dot did some drawings in the last thread. Chubby blank flank colt with a blue on blue color scheme, wild mane, and red eyes.